A hinge is a hand torn small 'v' made out of folded rice paper. There are many different types of rice paper, but the most commonly used for hinging are mulberry, sekishu, kozo, and shoji. The paper is chosen based off its thickness, weight, and its similarity to the properties of the artwork being hinged. Once the paper type is determined, the hinges are made. The framer begins by folding the rice paper back and forth, making sort of an accordion shape with the paper. From there, a tear bar is used to rip strips. It is important that the hinges are torn and not cut. 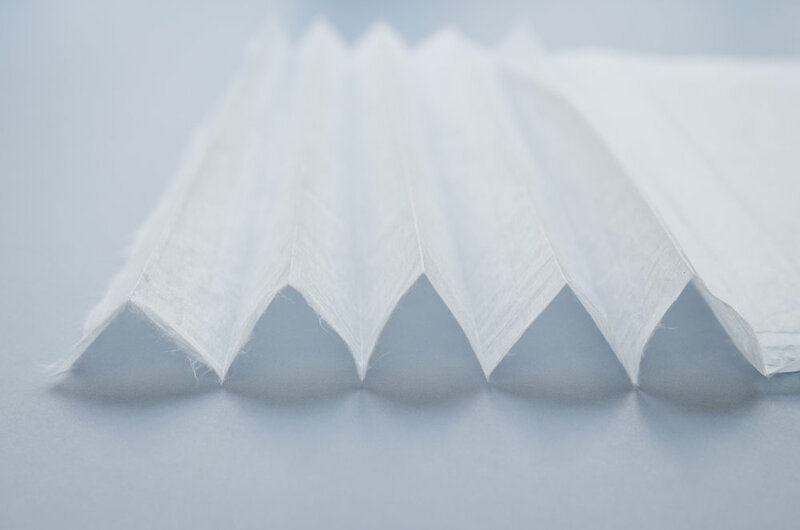 Cut paper has a defined edge which can show through to the front of the piece. The fibers of a torn edge make the transition smooth between hinge and artwork. The torn strips are folded and torn again. The size of the hinges are determined by the size of the piece. In general, the larger the work, the larger the strips. There are many variations on the types of hinges and the materials used to make them. The following describes a basic method for hinging a photograph into place. After the hinges are prepared, the framer is ready to adhere the artwork in place. They begin by covering the piece and carefully laying it upside down on its face (the front). The artwork is measured and the framer determines the layout for the hinges. Each day, a fresh batch of wheat starch paste is made using purified water. The paste is first applied to one side of the hinge using a small brush. Excess moisture is removed by placing the wet hinge onto the back of the hand. The framer then places the hinge onto the back of the artwork and then blotter paper is placed on top of the hinge to further remove moisture. A weight is then placed on top of that, causing the hinge to dry flat. Hinges are left to dry until all water is removed, anywhere from a few hours to overnight. Removing weights too early can cause buckling or wrinkles in the artwork. After all the hinges are completely dry, the artwork is turned face up and the framer centers the piece in the middle of the back mat. The next step is to apply wheat paste to the back of the hinges. Starting with the center top hinge, the framer places a small piece of plastic between the rice paper and the back of the print. It is very important not to get it on the artwork. The beauty of a hinge is its ability to let the artwork move. The framer lets each hinge dry with blotter paper and a weight on top, making sure the paper stays flat. After all the hinges are dry and the frame is prepped with spacers and glazing, the artwork is fit into place. Thanks for reading this very brief intro into hinging. Master hingers spend years refining their skills and conservationists spend their careers researching these materials and techniques. You can learn more about hinging by reading Conservation Framing by Vivian C. Kistler and Curatorial Care of Works of Art on Paper by Anne F. Clapp. Conservation Online (CoOL) is also another wonderful resource. Happy hinging!